In 2013 Annie went undefeated in the U2100 section of the Annual Recession Buster Open in San Diego. She won first place in the U-18 Girls section of the 2014 North American Youth Chess Championship, where she earned her WIM title. WIM Wang placed fifth at the 2017 U.S. Junior Girls’ Chess Championship, and won the 2017 Girls U16 World Youth Championship with a tremendous score of 10.5/11. WIM Wang was turned onto chess at the age of five while attending a festival at a park near her home and observing a simul. 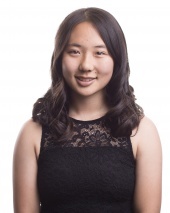 Annie remembers, “I was interested in the toy-like pieces and started learning chess.” In March 2014, Annie Wang became the youngest female chess master in the United States at age 11--breaking the record that had been held by Irina Krush since 1996. Annie held this record for one year, until Carissa Yip broke it in March 2015. The following year, she competed in the 2015 U.S. Women’s Chess Championship at just 12 years old. Annie currently lives in La Cañada, California and, though her father is a numerical-modeling researcher at the Jet Propulsion Laboratory, his daughter’s chess talent far outpaces his own. When she isn’t playing chess, Annie enjoys reading and spending time with friends.